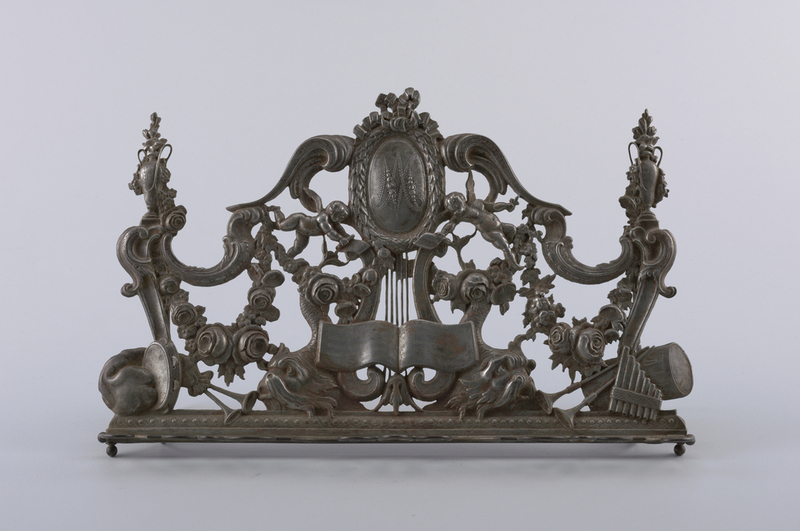 The initials “MA” in the central cartouche of this iron music stand belong to Marie Antoinette, who married the future Louis XVI of France in May of 1770. Winged putti fly over a musical score carrying banderoles inscribed with the surnames of Baroque French composers, including that of Jean-Baptiste Lully (1632–1687), whose opera Persée was performed during the wedding celebrations of the dauphin and his Austrian bride. The king’s metalsmithing hobby is ridiculed in a satirical print produced two years before his execution. Louis XVI is shown dressed as a locksmith and valet. The latter is a reference to his disguise during the royal family’s attempted flight from Paris, or “tour de France”, during the tumultuous summer of 1791. It also references the Compagnons du Tour de France, a fraternity of craftsman whose apprentices learned their trade by traveling throughout the country. The king, armed with a mallet and razor, approaches a mannequin head, evoking the decapitated heads being paraded through the streets of Paris, and foreshadowing his own gruesome end. Soulavie, Jean-Louis. Historical and Political Memoirs of the Reign of Lewis Xvi: From His Marriage to His Death, Founded on a Variety of Authentic Documents … and on the Secret Papers Discovered, After the 10th of August, 1792, in the Closets of the King at Versailles and the Tuileries. London: Printed for G. & J. Robinson, 1802.